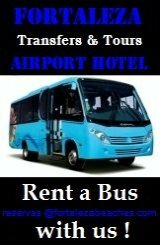 Fortaleza transfers tours and day trips from the International airport, Pinto Martins or your hotel in Fortaleza. After collecting your luggage, the passengers pass through an automatic glass door to the main floor of the airport. Where the driver waits holding an identification sign with your names on it. Fortaleza transfers tours and day trips are comfortable and safe. FORTALEZA BEACHES rents executive vans and buses for both affordable and safe Fortaleza transfers tours and day trips. Transfers and trips are available statewide including Cumbuco, Canoa Quebrada and Jericoacoara. 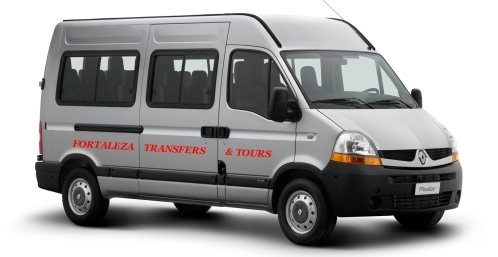 Our executive vans and buses are all equipped with air conditioning and ample space for luggage, to make your Fortaleza transfer tour or day trip both relaxing and comfortable. Fortaleza Day trips are availble with no pre-payment necessary. A practical and safe service that functions 24 hours a day with competitive rates and discounts on the chart below. 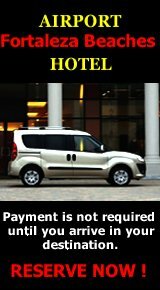 Payment is direct with your driver upon arrival at your destination. No need to send your card details. Fortaleza Beaches makes it easy to book your transfer or tour with our services! 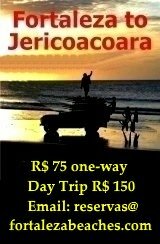 Frivate transfers, tours e day trips from the airport do aeroporto de Fortaleza. To confirm your trip just send us the date, time, complete names of the passengers, contact telephone number hotel or destination. We will check availabily and confirm your trip within 24 hours ! For more information or to reserve a transfer tour or day trip fill out and send the form below to FORTALEZABEACHES.COM. 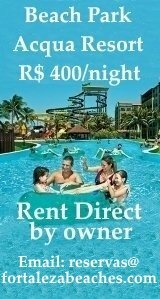 Reserve your Fortaleza transfer or tour now!